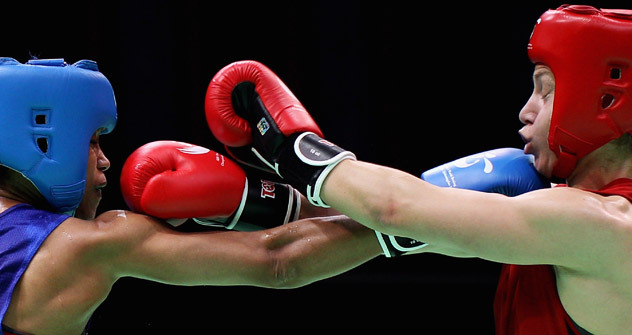 For the first time in the history of the Olympic Games, women boxers will fight for gold in London. The sport of women's boxing has long been a source of heated debate. Many have called it unpleasant to watch, cruel and against women’s nature. Nevertheless, the Olympic committee has voted for equality and this summer, women boxers will fight for the first time in an Olympic ring at the London games. Viktor Lisitsyn, the head coach of the Russian women’s boxing team, spoke about the sport and the upcoming competition with Vera Mikhailova of Russky Reporter. Russky Reporter: Do you think Russian fans are ready to watch women's boxing? Viktor Lisitsyn: Traditionally it is considered that boxing is not something that women should do. I often have to answer the question of why women are doing it. When I grow tired of explaining, I begin to ask myself: Why do women skydive and become ministers? There's no way of answering these questions. But people still try to find fault with boxing as though it were murder. But by comparison with other sports it is child's play. Look at the injuries people get in gymnastics! How many girls were killed or maimed! But no one cries out that you cannot do gymnastics. And in boxing there is one hit in the face, and at once people say, "Oh, how terrible it is, how it hurts." I think that when woman are hit, it inevitably evokes a sense of rejection. Is it so bad when a girl knows how to stand up for herself? Let some maniac try to approach her on the street — afterwards he will not be able to find his way home. Our girls grow confident in themselves. At the same time nothing bad can happen to them. We have no knocked-out teeth — the protection is good. And the chest is protected and there are mouthguards, so there are no serious injuries. In the ranking of the most injury-prone sports boxing is not at the top. RR: How does boxing affect the development of female athletes? Are they able to study, do they have time for personal pursuits? V.L. : We have beautiful girls who are intelligent and educated. World champion Sofya Ochigava speaks English like her mother tongue. And she is a good student and knows the classics. Or take Natalya Karpovich, who is a deputy of the State Duma, mother of six children, and in the past multiple-time world and European champion. In addition to sports, we also educate girls. Boxing provides a good way of teaching moral values ​​and principles. Nevertheless, men have from the beginning been better at martial arts. Is this because they have a higher level of aggression programmed at the genetic level? When a boy is born, he acts as a protector of his mother, grandmother and sister. And from childhood he learns how to use his fists. Women are different. So when they take up boxing or other forms of martial arts, they have to be made into fighters. This is a much more difficult task. RR: What happens to a woman at the end of her sports career? Does she take this aggression into her daily life? V.L. : Boxing has no relationship to life. It is confined to the ring, pure sport. In their lives they remain genuine women, and perhaps they are even more so than other women. They do a lot of hard work, so in their spare time they, on the contrary, want affection, relationships, and family. They marry and live well with their spouses. RR: How do the Olympics affect your view of the sport? V.L. : They provide an impetus to the development of women's boxing. Before it was developing well, but now there will be quite a boom. Look at how many countries are participating, what professionalism! Right now you look at women's boxing, and you don't notice that it's female. You see the beauty of the fight, the intelligence... Of course, there is always a difference between men and women, whether it's boxing or athletics: men and women run differently. But that does not interfere with the enjoyment of a beautiful race, the fight, the skill. RR: After women's boxing became an Olympic sport, you probably became better funded? Did you receive any allowances, donations? V.L. : Yes. Today we are not just getting by, we can live on this money. For the last two years, the available money went to support the Olympic athletes. What should be done? People have to be chosen. And we had just returned from the World Championship in China. You should have seen the conditions in which they live and train there, and look at what they get for that! Tough competition, boarding schools --- the Soviet system, which they adopted from us, works great there. They showed me a boarding school where they selected sixty of the best girls between the ages of 12-16 years. They live, train and study there... And there is such a boarding school practically in every city. And this is just for women's boxing! For other sports it is the same thing. We have nothing at all like that here. We are working somehow on inertia. The young generation is not that healthy. Many children need to be treated and not made to practice sports. RR: Most recently at the World Championship Team Russia won third place as a team after winning one gold, one silver and seven bronze medals, and the maximum number of Olympic licenses was three, one in each weight category. How does it feel? V.L. : Greatly fatigued. But we are satisfied because we completed the most important task: we were selected for the Olympic Games. In London we will fight for the gold. We plan on getting one gold medal. There is no other way. We were not born yesterday, we have gone through a lot of world and European championships, and we know our opponents. It is simply that the Olympic Games are conducted at a completely different scale. First, not everyone can stand the strain, and secondly, there is a great deal of luck. It happens that the winner is the one who wants it very much, not the one who is better statistically. We are counting on all of our girls, any of whom may become an Olympic champion. RR: And at the World Championships in China were you happy with the referee? V.L. : Yes, the refereeing was good. There may have been some close calls, but no one's head was knocked off. Well, maybe a little. Sometimes the calls are so bad that you can only lift your hands in dismay. Everything here is technical, only specialists say it. The judges tried not to offend anyone -- they did everything in their powers so that as many countries as possible won medals. They have the following policy now: it is necessary to involve as many female boxers representing as many different governments as possible. The first mention of women's boxing at the Olympics was at the 1904 Games in St. Louis, where women appeared in the ring for the first time at a demonstration match. Spectators of the female fights disliked it so much that over the course of almost the entire 20th century women's boxing was banned in many countries. Its rebirth began only in the 1990s. Almost simultaneously two amateur boxing associations (Swedish and English) sanctioned women's fights. In 2001, the United States hosted the first World Championship. Since then, the issue of including the sport in the Olympics was repeatedly raised, but a decision was made only on Aug. 13, 2009, when the International Olympic Committee made the decision to include women’s boxing at the 2012 Olympics in London. Female boxers fight in three weight categories: 51, 60 and 75 kg. Rounds in women's boxing last two minutes, instead of the three minute rounds in men's boxing. Boxers are required to wear a soft helmet and a plastic shield that protects the body.